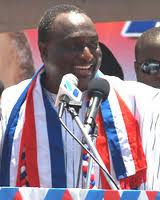 Kwadwo Kyerematen, one of the men aspiring to become flag-bearer of the New Patriotic Party (NPP), Friday made a surprise visit to an Accra Fast Track High Court where two NPP stalwarts, Dr. Charles Yves Wereko-Brobby aka Tarzan and Kwadwo Okyere Mpiani are standing trial for causing financial loss to the state. Mr. Kyerematen aka Alan Cash, a lawyer by profession, was accompanied by Kwabena Agyepong, his campaign strategist, ostensibly to show solidarity with Dr. Wereko-Brobby and Mr. Mpiani. He entered the courtroom not long after the case had commenced and sat quietly to monitor the proceedings and when the case closed, he exchanged pleasantries with Dr. Wereko-Brobby and Mr. Mpiani before being driven away in his black Toyota Land Cruiser. Dr. Wereko-Brobby, a former Chief Executive Officer of the defunct Ghana @50 Secretariat and Mr. Mpiani, former Chief of Staff in the erstwhile NPP administration and Chairman of the National Planning Committee for the celebration, have been put on trial for the various roles they played during the 50th independence anniversary and the 2007 African Union Summit hosted by Ghana. The two NPP stalwarts are saying that the charges preferred against them by the state “is a violation of their constitutional right under Articles 278 (1) (a) and 280 (1) (2) (3) (4) (5) (6) of the 1992 Constitution”, but the state insists the two men have a case to answer in the Ghana @ 50 celebrations. At their maiden appearance, the two accused persons pleaded not guilty to four counts of willfully causing financial loss to the state and were granted GH¢35 million self-recognizance bail. In the first count, the prosecution maintained that the two former NPP officials, between May 2006 and December 2007, willfully caused financial loss of GH¢499, 995.63 by spending in excess of the amount of $31.8 million approved by Parliament. The second charge says that the accused, between February 2007 and January 2009, willfully caused a financial loss of GH¢2.116, 906.91 in the form of interest paid as a loan from the Prudential Bank Limited without authority. In the third count, the two men stand accused of causing financial loss of GH¢966, 048.52, being bank overdraft from the Prudential Bank Limited without authority in/about September 2006. The fourth count says the two men, between May 2006 and December 2008, willfully caused financial loss by expending GH¢935, 249.8, being the income of the Ghana @ 50 Secretariat, without authority. Dr Wereko-Brobby, on June 27, 2010, moved a motion on notice to strike out charges preferred against him and yesterday, it was the turn of Mr. Mpiani to move a similar motion but Yonnie Kulendi, his counsel, had to cut short his argument because the prosecution, led by Chief State Attorney Anthony Gyambiby, had filed a supplementary affidavit which contradicted the substantive affidavit in opposition to strike out the case. The affidavit deposed to by one Elikplim Agbemava of the Attorney General’s Department indicated that the Ghana @ 50 Commission of Enquiry’s report, based on which the two NPP men had been charged, and the white paper issued by the government were published in April and May 2010 respectively. But in the supplementary affidavit, a copy of which was yet to be filed on the court’s docket and another given to Mr. Mpiani and Dr. Wereko-Brobby, the deponent said the report and the white paper were both published in April 2010. The court presided over by Justice Samuel Marful-Sau of the Court of Appeal then enquired from the Chief State Attorney what had gone wrong and Mr. Gyambiby then dropped a bombshell, saying the whole Ghana @ 50 Commission Report published by the Assembly Press in Accra had no date on it. The judge then said since the date on the report was very relevant, the case needed to be adjourned for the defence team to also make their checks from the government publisher and also for the prosecution to make amendments to the affidavit. Sitting continues on July 27, 2010.